The origins of language is, in some ways, more complicated to study than the origins of other biological traits because language does not fossilize or leave behind physical traces the way that bones and tissues do. However, there are other ways to study the origins of language, such as watching children learn to speak, analyzing genetics, and exploring how animals communicate. A recent review of animal communication in particular has yielded an intriguing discovery: while structured animal call sequences (for example, birdsong) are widespread, it is very rare that meaningless sounds produced by animals form meaningful sequences, as they do in human languages. This observation, combined with supporting evidence from human languages, has led linguists to suggest that syntax (the structure and rules of language, such as sentence structure) may have evolved before phonemes (the meaning-differentiating sounds that do not themselves have meaning). The researchers, Katie Collier, et al., at the University of Zurich in Switzerland, have published a review paper on this idea that syntax evolved before phonology in a recent issue of the Proceedings of The Royal Society B. In their study, the researchers also hypothesize that syntax is a cognitively simpler process than phonology. Collier, a PhD student at the University of Zurich, explains exactly what phonology and syntax are. "A simple example for phonology would but the way the phonemes /k/, /a/ and /t/ that have no meaning in themselves and are used in many different words come together to form the word 'cat,'" Collier told Phys.org. "Syntax is the next layer where meaningful words come together into larger meaningful structures, such as 'the cat ate the mouse.' 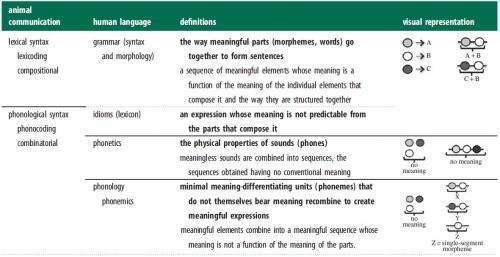 Phonology and syntax describe the way sounds form words and then words form sentences, rather than referring to the sounds and sentences themselves." At first, the idea that syntax evolved before phonology seems counterintuitive, and it's true that it goes against the traditional linguistic view that phonology is simpler than syntax. "It may seem counterintuitive, but it is not quite as simple as saying sentences evolved before grunts," Collier explained. "Animal calls or grunts most probably existed before 'sentences.' Most of these calls do not have meaning in the way that human words have meaning. A few have what we call functional reference, where they seem to denote an external object or event, such as a leopard for example. However, these calls cannot be decomposed into smaller sounds. They come as a single unit, unlike our words that are made up of several sounds that are reused in many different words. This is why we argue that there are no known examples of phonology in animal communication. On the other hand, as discussed in our paper, several species seem to combine these referential calls together to obtain new meanings in a similar way to very simple sentences in human language, which is why we argue that they may have a form of rudimentary syntax. "I suppose a very simple way of looking at it would be to say that some animal species have 'words' that they can combine into 'sentences,' but their 'words' are simpler, less flexible than ours, made out of one block, rather than several reusable ones." In their paper, the researchers reviewed a wide range of evidence that seems to support the origins of syntax before phonology. In the primate world, two species of monkeys—Campbell monkeys and putty-nosed monkeys—demonstrate this idea in slightly different ways. Both species have two main predators, leopards and crowned eagles, and both species give specific calls when they detect these predators. Campbell monkeys call "krak" at a leopard sighting and "hok" for an eagle sighting. For putty-nosed monkeys, the calls are "pyow" for leopard and "hack" for eagle. While it's interesting that these monkeys seem to have specific "words" for different things, what's more interesting to linguists is that the monkeys modify these words to mean something different yet related. For example, the Campbell monkeys add the suffix "-oo" to both "words." The "krak-oo" call is given to any general disturbance, while the "hok-oo" call is given to any disturbance in the canopy. The researchers explain that the "-oo" suffix is analogous to the suffix "-like," changing the meaning of the call from "leopard" to "leopard-like (disturbance)." Due to how it combines two meaningful sounds to create a new meaning, this structure is an example of a rudimentary syntax. The way that putty-nosed monkeys alter their calls is more complicated. Whereas "pyow" means "leopard" and "hack" means "eagle," a sequence of two or three "pyows" followed by up to four "hacks" means "let's go," causing the group to move. There are a few different explanations for how this sequence may have originated. One possibility is that the sequence may be an idiom, where the original sequence may have meant "leopard and eagle," later becoming "danger all over," followed by "danger all over, therefore let's go," and finally just "let's go." A second possibility is that "pyow" and "hack" may have more abstract meanings, such as "move-on-ground" and "move-in-air," and their meanings change depending on the context of the situation. Although neither explanation demonstrates with certainty that the putty-nosed monkeys structure their calls with a syntax, the sequences leave that possibility open. Further evidence in support of the idea that syntax evolved before phonology in human language comes from analyzing a variety of human languages themselves, including sign languages. As far as linguists know, all human languages have syntax, but not all have phonology. The Al-Sayyid Bedouin Sign Language (ABSL) used by a small society in the Negev region of Israel is an emerging language that has been around for less than 75 years. Interestingly, it does not have phonology. For the ABSL, this means that a single object can be represented by a variety of hand shapes. However, the ABSL still has syntax and grammatical regularity, as demonstrated by the existence of rules for combining signs. Perhaps the presence of syntax but not phonology suggests that syntax originates first in the evolution of a young language, and perhaps also that it is simpler than phonology. When looking at this hypothesis more closely, many aspects of it make sense. From a cognitive perspective, syntax may be simpler to process than phonology because it is easier to remember a few general rules than many phonemes. Having syntax allows speakers to express many concepts with only a few words. As language develops further, and still more concepts need to be communicated, phonology emerges to provide a larger vocabulary. The evolution of phonology may also be strongly influenced by cultural, rather than biological, evolutionary processes. The researchers hope to further develop these ideas in the future. "To support our hypothesis that syntax evolved before phonology, a lot of work can still be done," Collier said. "Many animal communication systems are still very little understood or described and the more we learn about them, the more we can adjust and refine our hypothesis. From the linguistic side of things, studying more emerging languages (mainly sign languages) would show if there is a pattern for syntax to develop before phonology in human languages." Words DO "fossilize or leave behind physical traces": all forms of writing, whether cuneiform tablets or printed pages, are essentially just that. The "fossil record" doesn't stretch back all the way to the origins of language, and it leaves much open to debate, that is true, but it does exist. I find the concept of the article very interesting, though. The pattern becomes clear before the individual pieces do. Err, am I missing something here? In this story, the suffix "oo" appears to be a phoneme. You combine the phonemes oo and krak to make a new word. Making new words is common and easy to do. Making new syntax, not so much. Syntax is algorithmic in nature- it's a schema that encodes meaning by virtue of a systematic development and presentation. This "system" of presentation is more fundamental than the word-sounds it organizes. Words convey part of the message, but for most languages, the message is not complete without the syntax. As for fossil records of language, while the written record is there, the phonetic information (what the language actually sounded like) is often completely gone. Quite true. However, fossils of plants and animals also have information completely missing from them, so I think the metaphor works quite well. Human language did not evolve from animal calls. Humans do not need sound to communicate. The human version of animal calls still exists and is present in a different part of the brain to that of language. Children do not form words out of the human versions of animal calls including crying, laughing, calling out in pain and so on. Children start from meanings and form words, signs or gestures from there. The first form of language in children is gesture eg pointing, holding items to the parent eg the empty bottle and so on. These researchers simply skipped earlier communication in children and went straight to vocal language. Any model of human language acquisition must include the process for deaf children that acquire language at about the same rate as hearing children. It is interesting to note that birdsong is once again mentioned with regard to language. The last common ancestor between humans and birds was reptilian and did not sing. with the research mentioned in the above article relating to the last step, the formation of particulate communication. Read the paper before seeing it mentioned here. It struck me that it rests nearly entirely upon work that needs replication on Al-Sayyid Bedouin Sign Language. Further, work by independent researchers might confirm Al-Sayyid Bedouin Sign Language does not have phonology but that it could be that its apparent lack of phonology links to some overlooked confound tied to its recency--people, after all, only started using it after 1940. Interesting. Phonology is more complex rule building (they claim) compared to syntax, but also on a more fine-grained level. That in itself would be a prediction. Notably, in animals "phonology" is the evolution of the symbol sounds (like "leopard" or more generic "move-on-ground"). Our initially sounds must have been like that, before we started to expand cultural phonology and the vocal mechanisms coevolved with language. Both tool making and sexual selection would promote it. Good point! But early written language was not supportive of phonology, e.g. icon-like words. Another support for this theory perhaps, since it mimics language development and its difficulties. - "Human language did not evolve from animal calls." Well, we don't know that, and most theories adopts that simpler pathway. - "Humans do not need sound to communicate." Archaea do not need sound to communicate. - "The human version of animal calls still exists and is present in a different part of the brain to that of language." That would be interesting! Do you have references? - "Children do not form words out of the human versions of animal calls including crying, laughing, calling out in pain and so on." Young animals also have large eyes and other traits that encourage adult animals to care for them. Very young children are not sentient, and their vocalizations may have nothing to do with later language. - "Any model of human language acquisition must include the process for deaf children that acquire language at about the same rate as hearing children." Why? Learning is universal, and its rate too, and the evolved abilities are shared if not always expressed. Oops. I meant conscious, not sentient, re children. English fail. Also, I should generalize my comment on communication. Cell-to-cell communication derives way earlier, in one of our universal common ancestors (UCAs), before the last UCA. @RKS: "It is interesting to note that birdsong is once again mentioned with regard to language. The last common ancestor between humans and birds was reptilian and did not sing." [I need more coffee.] Oops. Vocalization evolves in fishes of course, it's not a stem trait. "A group of rhythmically firing nerve cells in the fishes' brains determines the contraction rate of muscles attached to their swim bladders and controls the pitch and duration of the calls." "This is precisely the same pattern of brain development seen in other vocalizing vertebrates, including birds, amphibians, and primates such as humans. "The last time all of these creatures shared a common ancestor was more than 400 million years ago, when the evolutionary line that led to toadfish split from the line that eventually led to land vertebrates." So it can be older, but perhaps not much. @RKS: Interestingly, this find may reject your claim of "different part" for calls, if it identifies a shared part for all vocalization. Then again, calls evolved on that basis. This is not my area, which is why I have so many questions. animal calls are generated by the brain stem, language is present in the Broca's and Weinecke's area. There is still sum debate as to whether these areas exist in H.erectus, let alone earlier hominids and certainly not in our chimp cousins. It is no different for humans. Those born without a cerebral cortex still have the full range of calls such as vocalised laughing, crying, pain calls and so on. Calls such as the above are unlearned and so are innate. All language is learned. Further, the deaf still make the standard animal calls (as mentioned above) even though they can't hear them. They do not spontaneously make language sounds. Human language (syntax and grammar, contextual word meaning) can not be learned by signing chimps indicating that the formation of phonemes and syllables is not the prerequisite of language. Higher brain processing is required. Even Descartes discusses communication with the deaf. The deaf communicated long before sign language. The intuitive answer to language genesis is that it developed from calls. We make sound, calls make sound, so they must be the same?? What evidence we do have is that babies do not morph calls into words. Laughing, crying, pain calls do not morph into words. Baby's first conscious communication is gestural, and there first communication sounds are prosodic in nature. Prosody becomes syllable like, but this is copied off parents. There is plenty of evidence to show that babies lose word sounds not used in the language of their parents eg Japanese losing the 'w'/'r' distinction and westerners losing the subtle tonal differentiation known in Chinese (for instance). Chimp, gorilla and bonobo language experiments prove conclusively that the ability to speak is not the precursor of language. It is an ability to arrange concepts in a particular way. Once this cerebral change occurs then language can find numerous expressions including pictorially, gesturally, prosodically, verbally. Words DO "fossilize or leave behind physical traces": all forms of writing, whether cuneiform tablets or printed pages, are essentially just that. Those are recent modern developments. Spoken language is much, much older.